During the campaign, Donald Trump promised to eliminate the H-1B visa program, though he flip-flopped on the issue many times. Now, with the end of his first 100 days in office quickly approaching, President Trump hopes to show he’s advancing his “America First” ideology by issuing an executive order cracking down on the H-1B visa program on Tuesday — though it’s just the first step in a complicated reform process. Senior administration officials told reporters that the order will direct Commerce Secretary Wilbur Ross to prepare a report by Thanksgiving on waivers and exceptions made to “buy American” rules across the federal government, and how to close those loopholes. The “hire American” element of the order will focus on preventing H-1B visa holders from “undercutting American labor at less cost,” according to one senior official. Under the program, the government uses a lottery system to award 85,000 visas to high-skilled foreign workers each year. Tech companies say they rely on the program to make up for a shortage of Americans trained in science and engineering. But critics say these companies abuse the program, replacing Americans with foreigners who will work for a lower wage and who are often stuck in their position for years as their green card application is being processed. Administration officials said 80 percent of workers who enter the U.S. on H-1B visas are paid less than the median wage in their fields. After signing the order, Trump called the H-1B’s random lottery “totally wrong.” “No one can compete with American workers when they’re given a fair and level playing field, which has not happened for decades,” the president said. The officials said reform could first come through administrative changes, such as raising the visa application fees, adjusting the wage scale to more accurately reflect prevailing salaries in the tech industry, and more vigorously enforcing violations. It could also change the lottery system to give foreigners with U.S. master’s degrees a leg up. These are just possible fixes, and the executive order probably won’t offer tech leaders much clarification on what reform will actually look like. H-1B applications declined from 236,000 to 199,000 this year, with employers uncertain of what changes might come under the Trump administration. There’s bipartisan agreement that the H-1B program needs to be fixed, and critics say Trump could have simply directed federal departments to start recommending reforms, without issuing an executive order. 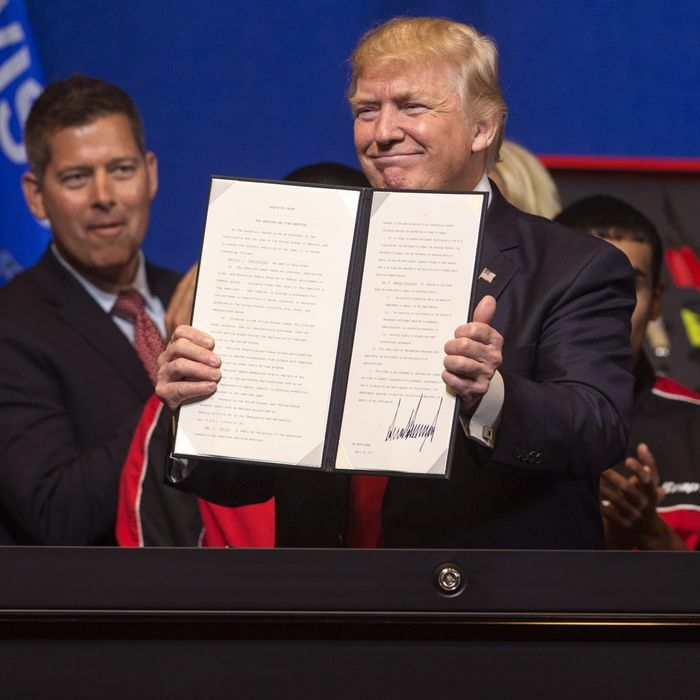 Signing an executive order lets Trump highlight his commitment to fulfilling his promise to protect American workers, but he can’t do a thorough overhaul of the program on his own. Changing certain fundamental elements, like how many visas are awarded each year, requires action from Congress. As NPR reports, a number of lawmakers have been trying to advance such legislation, but those efforts have stalled. “We’re encouraged that this is an important first step. It essentially means the president is turning his words into action,” Scott Boos, a senior vice-president at the Alliance for American Manufacturing, told the Post. Though, he added that “the true test” will be what the Trump administration does when it gets to actually proposing new policies.